CARACAS, Venezuela (CNN) -- Just six years after trying and failing to seize power in a bloody coup, Hugo Chavez apparently succeeded in seizing the reins of Venezuela via the ballot box Sunday. With about 65 percent of the vote counted, the left-leaning populist had captured 56 percent of the vote, compared with 39 percent for his nearest challenger, Henrique Salas Romer, the Yale-educated former governor of Carabobo state, according to results from the National Electoral Council. Salas conceded defeat Sunday evening. Chavez supporters danced in the streets, set off fireworks and honked their horns in celebration. 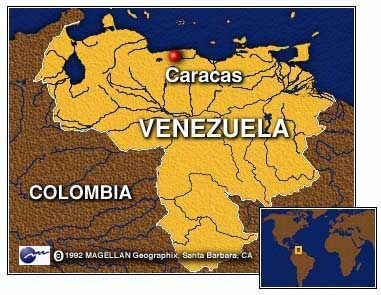 "Venezuela is being born again," Chavez said on Venezuelan television. "Once again the people of Simon Bolivar have shown themselves to be a grand people." Bolivar is the hero of Venezuelan independence whom Chavez often invokes in speeches. In an interview with CNN, Chavez said his first task would be to try to heal the divisions brought on by a fractious and often bitter campaign. The election of Chavez is a stunning blow to the political and economic establishment that has held sway in Venezuela for 40 years. Both of the country's traditional parties, COPEI and Democratic Action, dumped their candidates at the end of the campaign and backed Salas in a last-ditch effort to stop Chavez. In February 1992, Chavez, then a lieutenant colonel in the military, led an attempt to overthrow Venezuela's elected government. It failed, but he became something of a folk hero among the country's poor. After he was released from jail in March 1994, he formed his own political movement, which stunned the establishment by capturing a plurality in Congress in November elections. A Robin Hood-style hero to supporters and the devil incarnate to his critics, Chavez's candidacy split the country along class lines. 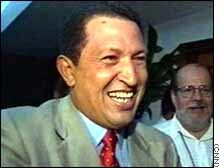 His calls to dissolve Congress and rewrite the constitution led Salas to charge that Chavez has dictatorial ambitions. "They've called me a new Mussolini or Fidel Castro or said I sleep with a book by Hitler for a pillow," Chavez said. "But the people know the truth. They know who I really am." Indeed, many Venezuelans, fed up with endemic corruption and the government's inability to eradicate poverty despite the country's oil wealth, viewed voting for Chavez as a way to strike back against the establishment. "Down with the oligarchy," shouted one woman standing outside Chavez's Caracas headquarters Sunday. Voting Sunday, which took place amid tight security because of fears of possible violence, was described as orderly, and turnout appeared to be high. 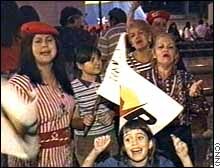 Before the ballot, there were fears of a counter-coup to prevent Chavez from taking power -- or of violent street protests if he should lose. That prompted an appeal for calm from President Rafael Caldera, who was constitutionally barred from seeking another term. "The government and armed forces have promised to respect the electoral results. That respect will be sacrosanct," Caldera said. "We demand that the results be accepted in peace." Correspondent Harris Whitbeck and Reuters contributed to this report.